That Kelly Link is a fearless writer who slaps fiction on your plate and dares you to eat it cannot be denied. 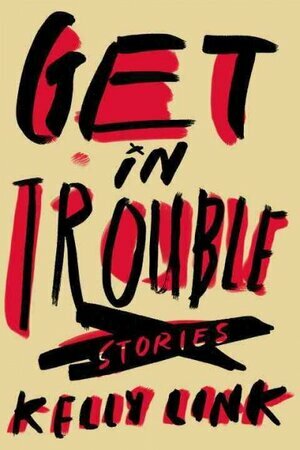 In a previous review of her story collection Pretty Monsters I enthusiastically gave her YA writing a thumbs up, so I was relishing another crack at her quirky brand of prose with her latest collection for adults, Get In Trouble (Random House, 2015). A number of themes and images run through these stories, if stories they truly be. Girls or women who are bored or bothered by boyfriends or things they don’t understand. Superheroes (too many, IMHO). Ghosts. Alcohol, always alcohol to fail as the longed-for panacea. And at the heart of everything, the stinking beast that is Florida. Link’s prose sometimes runs off like Hunter Thompson trying to figure out why he has two shadows, and so what if he’s just an ordinary housewife who doesn’t understand her husband? Link loves to conflate the voice of the narrator with the voice of any number of characters in a story, dispensing with quote marks, throwing in cryptic catch-phrases that refer to a code that may or not reveal a meaningful connection or emotional truth. This makes the stories a bit of a struggle at times, though when the prose truly clicks, and Link reins in the overly clever cute stuff, it can be LOL funny. At their best, they leave a queasy feeling and give the reader plenty of space to figure out the meaning. At their worst, they’re repetitive and boring. Sometimes a story shows both. None of the characters in these stories have what I would call an “aha!” moment. No startling revelations, no fateful choices, but more than likely a turning of some sort that changes the atmosphere from, say, gaiety to blurry apprehension. You have to sort through the rubbish for a payoff; readers more accustomed to having this neatly arranged by the author may lose patience. I won’t pretend that at times I grew weary of tripping through disgorged prose or pretentious characters who didn’t connect with me. But in most of the stories I would inevitably find a nugget or two—a wacky observation or cleverly turned phrase—and I’d do a mental fist pump, yes! Kelly, you still have it! It’s funny little observations and clever inventions like these that make Link a worthy read. I only wish there were more of them here, and fewer of the confusing, nonsensical ones.